Well, its not officially spring, but it seems as though spring has come ahead of schedule this year. And when the weather is nice, what better to do than go fishing. With a forecast reaching temps near the mid 60s, something not seen since perhaps October, I was already laying plans to hit some water. 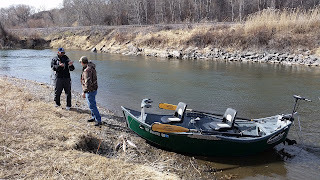 About then I received a message from a friend in Billings: his brother-in-law was visiting from out of state - could the two of them come and fish with me? That was an easy "yes," given my current plans involved no one other than me. I fired back a message to Travis (the same Travis from Beartooths) and laid out a plan for when the two of them arrived. It involved a day of hiking and rock scrambling. That's when he informed me that his brother-in-law Justin had a broken leg. Well, good to know. Scratch that first idea. Plan 'B' took root and I hitched up the boat. Justin and Travis arrived late Friday night. They crashed in the basement and we were all up and heading down the road before daylight. We made a quick stop at Hardee's (well, quick for crutches) to calorie up on greasy biscuits. Travis and I poked fun at Justin by making sure we got him an ADA-approved table equipped with all the appropriate handicapped signage. I'd never met Justin before, but it was quickly evident he was a guy who could be messed with. 50-ish miles later we had dropped a car at the take-out for shuttling and were launching at the top of our 9 mile run. Crutches were stowed like spare rods alongside the net. 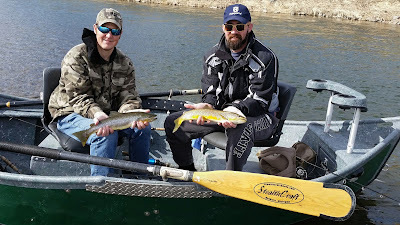 This was to be a jig fishing trip, and light spinning rods were strung up with an array of jigs - various marabou and Zig Jigs, Glass Minnows, and assorted plastics. About 20 minutes into the float and looking for the first strike Travis made a statement about how tough the fishing was obviously going to be. What'd he think this was, a magic boat? I told him I wasn't ready to commit to a prediction like that - sure, the wind was a pain in the rear, but it was going to warm significantly today and we hadn't even hit a decent looking hole yet. I eased across the river with the oars to a vertical wall jutting out against the flow. A former side channel dumped in here and that, combined with the vertical bank, made for the first grade-A hole we'd come across. I was floating blind today, having chosen a section of river to explore that I hadn't yet floated through. Travis was the first to get a hit, but it didn't stick. Justin was still working at getting the hang of the presentation I was trying to describe - hard pops, free-falls, and subtle flutters. I swung a couple different types of jigs through the hole and picked up a solid 16-17 inch rainbow on each. Perhaps things were 'looking up' (we were still in sight of my truck...). 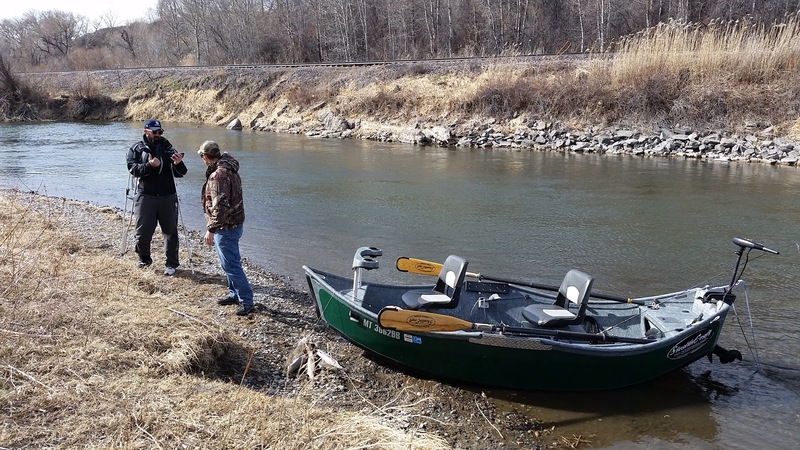 We may have picked up a hit or two as we went along, but the next real action came when we maneuvered between some islands and found a great pocket of water hidden from the main river. It was a couple acres in size with woody debris exposed in the middle and around the perimeter. Current hugged the edge and flushed through, making the entire area viable habitat. It readily gave up a few rainbows and Justin landed his first Montana trout. ﻿﻿I found our first brown to break 20 inches for the day. 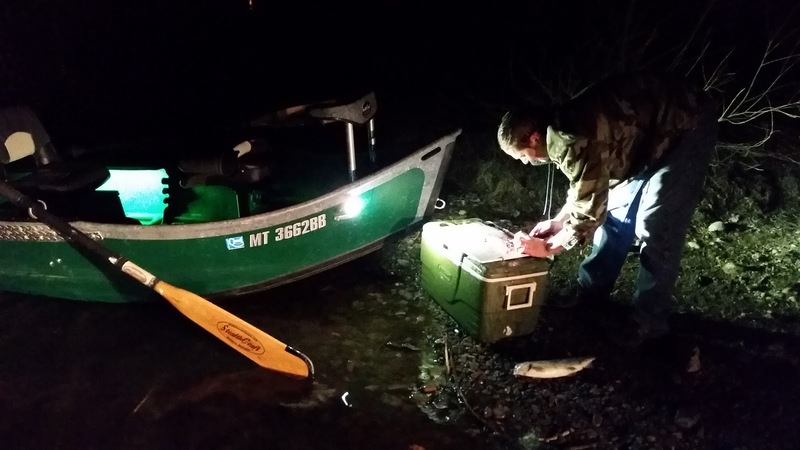 Travis landed a sizeable whitefish. Then Travis and Justin doubled on good browns and I had the privilege of netting one on top of the other, piling them together in the net. 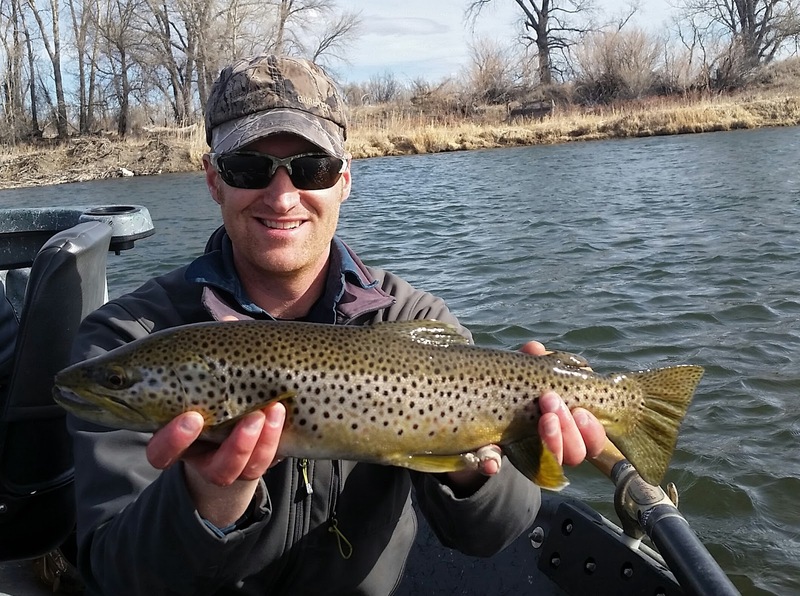 Travis's was the second brown of the day to reach 20 inches. 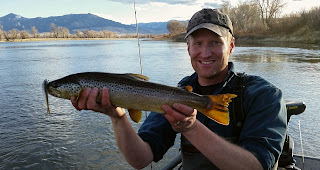 Right before we exited that perfect blend of current, depth, and structure, I nailed a 22-inch brown. One of those fish that's half head and covered in old scrapes and battle scars. 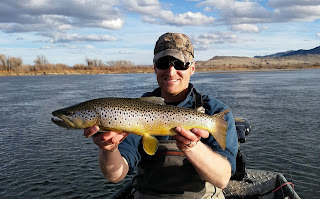 Although a few bright and scrappy rainbows were headed to the cooler for introduction to a frying pan the following day, each of the big ole browns were slipped back into the river. 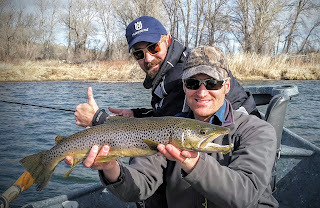 We continued on down the river, nowhere near halfway through our trip and already with enough action under our belts to have left satisfied at the end of the day. As the miles floated by we passed through both occasional hot pockets of action and stretches of seemingly dead water. In the middle of the day small trout started feeding on midges along foam lines. Justin and Travis doubled on nice browns a second time. I had hopped out and walked the boat onto a gravel bar where they could reach the head of an awesome looking run. I netted Justin's first while standing outside the boat. A few seconds later I scooped Travis's and Justin's made a jump for it. 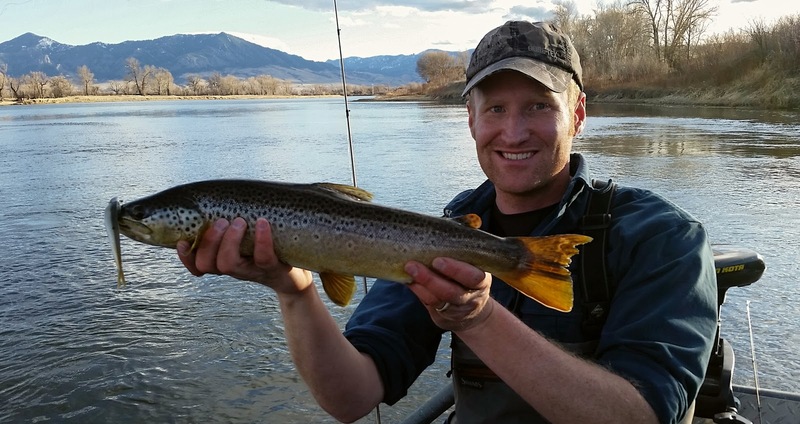 After a brief encore battle I netted it again and hoisted a net with two browns for the second time today. A passing jet boat drifting by got to witness the whole event and waived in approval. One of only two other fishing boats we saw all day. 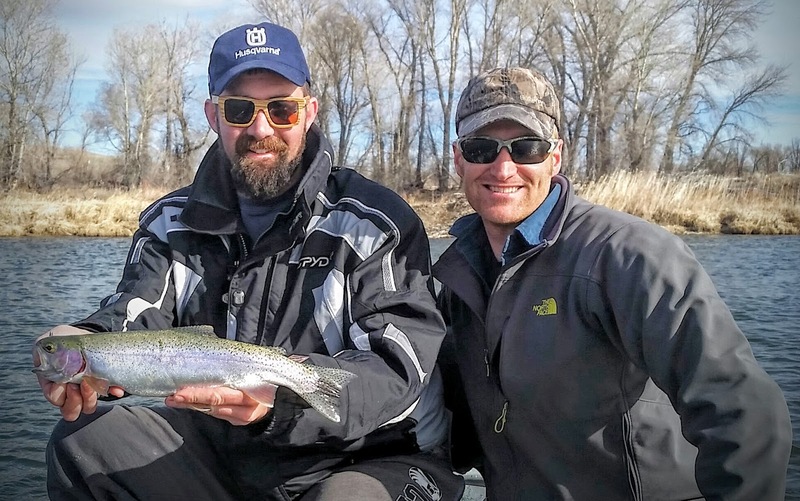 Fishing couldn't be described as "hot," but when the events spanning ten hours on the water are condensed into a summary, it's hard to ask for a better day. We continued to pick up fish here and there as we floated on. The 'dry' spells seemed to be getting longer, but still most everything we were connecting with was solidly between a fat 16 and 20 inches. Justin landed the heftiest rainbow of the day, topping out at 19 inches. The big fish outnumbered the small. Even what we didn't connect with was large. Justin once had a brown head-and-shoulders bigger than anything we'd landed that day come chasing across a shallow shoal. It looked like a redfish charging a topwater over an oyster reef. Made my heart stop to see it. How he didn't hook up with it I don't know. I think he'd been rubbernecking at the scenery and didn't see the fish at first. It even came back for a another try when he quickly served it a second cast. Some time later I watched Travis hookset into an immovable fish. It bulldogged a couple times with long, wide throbs and then surged into a run like a steelhead that had suddenly decided to return to the ocean - and popped free. 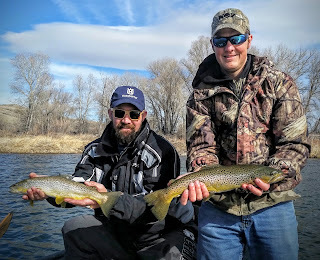 The 22-inch brown I'd taken earlier turned out to be the longest fish of the day, but I caught two more at and over the 20-inch mark in the final leg of the float. Both took an oversized plastic jerkbait on a jighead more traditionally suited to largemouth bass than trout. The first and heftier of the two was in a classic seam where two currents melded together on the tail-end of an exposed gravel bar. He came out into the perfect evening light for a photo against the backdrop of mountains. 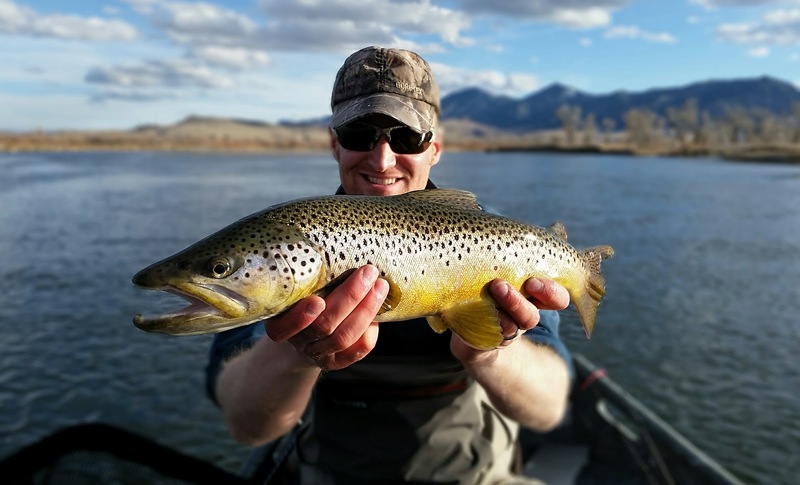 The second came from a shallow little pocket along the bank that looked more like a rearing pond for water striders than the haunts of a mature trout. But there was something about it that made me cast to it. He blasted the surface and tail-walked across the shallows and out into some depth where he could do battle in style. We exited the river after sunset, filleted the rainbows slated for Sunday dinner back at Travis's house by the headlights of my Stealthcraft, and then hit a little Montana diner for a hearty burger before we parted ways. I'm sure there's more winter yet to go, but after a day like that, I say bring on spring! How long does it take to photos hop that same mounted brown into your background pics?